Here are some tips that I have either gathered from the forum, or just some tips that I had myself. The aim of this game is like any other otome game, to get the CGs & Ending. Percentages would be shown when you try to get your star to do appearances or dates. The higher the percentage, the higher the chance of the appearance or date be successful. by playing the mini games with the (Lesson) beside the venue. Secondly, you can go on dates with your star via Venues with (Dates) beside. more energy would required, vice versa. energy as compared to going for appearances. Lastly, (Appearances) are important to shine your star, your star . you have to up your star 's skills so as to appear for higher levels appearances. You can check your star's status via the 2nd button at the bottom of the game screen. trust point with NPCs & your manager lvl. and of course for scheduled appearances, lessons or part time jobs. Of what I know, the manager's level is only important for scenarios. otome games. There's no wrong path. There's only wrong choice of replying. Try to remember the highlighted parts. type the notes somewhere, probably on the URL or your window's sticky notes. You don't have to follow your cursor along with the tick. I think this is a mistake when everyone is playing the dancing game for the first time. stay put on one comfortable spot and click accordingly to the tick. Also, watch out for the beat at the beginning. The moment the tick left the screen on the right, click IMMEDIATELY. It takes a little practice but you'll get the hang of it pretty quickly. Analyse the table at the bottom of the screen before you start. You can use the same one emotion for any of the emotion that the NPC makes. The easiest way is to relate the expression you are suppose to make with the NPC's . think of it like Touya is angry at the NPC but she just give a silly smile. Also, most of the times, there are expression that you are "allowed"
to do that are overlapped. Which makes it easier to finish the mini games. 1 . Remember the speech bubble. Just remember the 1st word. For example remember "What" & "Oh"
2. Remember the face & body gestures of chibi Touya. 3. That's the number of mismatched parts. Divide the number by 2. In this case, 4/2 is 2. SO, you only 2 steps to complete the picture. 4. That's the time left. is to do a screenshot and then refer to the picture thereafter. To do a screenshot, press "Print Screen"
then, open Paint & paste ur screen shot there!! ANYWAY, so, when you start the game, the first scene would be for you to memorise. be the same as the "picture" before you. Firstly, remember the speech bubble. Secondly look at either 2 of the Touya-s. I think that's the easier way. especially the Bookstore guy & the Gift store girl where their mouth actually are pretty similar. For the speech, its pretty much based on our knowledge of the world & also the game.
. Also, you can see if you a eligible for the next scenario by clicking on the "EVENT"
above your company building. There's typo for the game. There shouldn't be the word "MORE" beside the numbers. So take note of that. if you are able to fill the bar full within the time limit or the number of rounds. Edit: Visiting the house of fortune would allow you to get manager exp!! Notes: Part time jobs at the restaurant, pet shop & the clothes store is still unavailable. Also, Ballroom serve no purpose as yet. Hello, I need some help with this game. I've started to play it yesterday, but I don't know to do. I'm in the beginning and I don´t know how to advance. If you can help me, I'll be a very grateful to you. I keep failing the memory game which is matching master! Hi~ just wanna know which level are you at for the memory game? Hi! Its because the clothes store is still unavailable to play yet. And since the trust point is to allow you to earn more money when doing part time job etc, so currently its impossible to increase Kurisu's trust. So I guess we have to wait for the next game update. Please help. I dont even know how to go to a city much less a lesson or a date. How do I leave the beginning room of the office? How to do I move? HELP. There's a "Leave Office" option when u finish looking at the conversations in the office. Have you finished the tutorial? What do u mean by "bad"? But from what I know, you still have to bring touya out for dates even if you have ren. U have to go to touya room and click managing to take the chiar. After this u should go on dates to increase his good mod. Do you know how to make Ren another permanent Star? I'ts just that he is with me like for nine scenes o days? (I didn't undestand that really well) and a extended contract it's awfully expensive. And i don't undertand the part that says: If you get the good ending he will be yours forever??? Please help. It meant that if you get all his scenarios, you can get Ren to stay permanently. Yeah~ I noe the contract is awfully expensive.....so I guess the best well to end money is to use Touya and earn the money. Hhahaa its ok~ poor touya....I'm fine with earning money, but I got too bored playing with the mini games tat I gave up. And also watching the conversations when u go for dates, despite being able to skip, its still annoying. I earned about 21 mil stars.....and I can afford for one contract which is for one week i guess. Hahahaa hmmm maybe u can try to off the music and play it? That's wat i usually do. 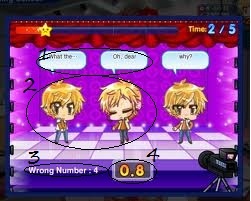 Or maybe you can number them in ur mind like " 1......1,2" and just repeat when its ur turn to "dance"
Well, for me, I use Touya to earn money (duh!) I suggest you up the "skills" of Touya so tat u can at least let him go for lv 10 appearances,which actually needs lots of energy @@" I guess u need lots of patience, cuz in my case, I gave up on the game already "OTL I've completed Touya's story. Ahh no problem. when u start the game, the 1st scene u see is wat u need to memorize. There's time limit, therefore u have to memorize it within the time limit. When the curtain closes & open again, this is whr u gain control. U have to make it in a way tat the "picture" is exactly the same as what u memorised. Take ur time since there isn't any time limit for the 2nd part. Alternatively, u can print screen the "correct answer", paste it in paint, and refer to it. okay, I'll try! thank you very much!! hey so i was wondering if you finish with touya can you have an ending with ren too??? Hello i would like to ask how am i suppose to use the cupid scent? I believe u can give it to him by going to his room and "Gift"
I think it's when you're preparing the date. How do u get Ren at the start of the game??? Ehhh that I'm not so sure. But Ren will join you after a "cutscene", maybe you can try entering the office repeatedly? y do the new star are soo late to come ??? What exactly are the requirements for the star's "good" endings? Is it that you just have to make it through their scenarios and be above a certain love point? 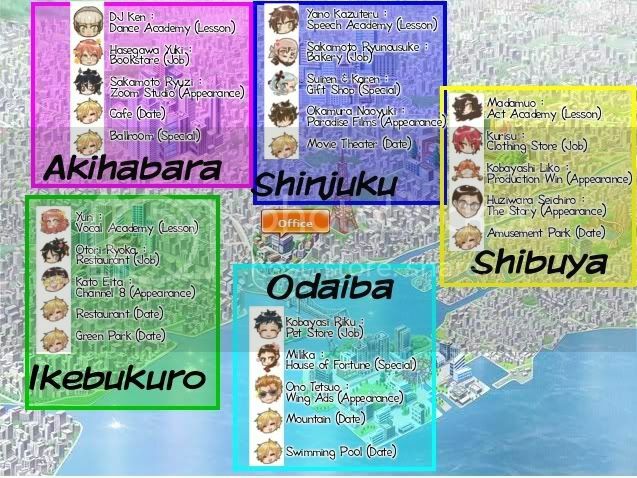 Also, I noticed that there are many events for both Touya and Ren, but for Ren, do you only need to complete the scenarios (I think he has 29 or 30?) to get his ending or do you have to do all the events with him before you can keep him permanently? The requirements would be to get all of their scenarios. You can only see the scenarios at certain love point level. You can see how much love points you need for the next scenario by moving ur cursor over to the office building. And yes, the true ending is after the other scenarios. At the photo album part, the true ending is at the last pages. And to keep Ren permenantly, you have to finish all the scenarios with him. Um...excuse me. I have a question(obviously) about how to actually get to play the game. See, I made an account on it a way while back. Probably about 4 to 5 months ago. But when I signed in, it said and I quote this after I couldn't get started playing and sent a re-validation of my email address, assuming that was the problem to the site:"A validation e-mail has been sent to your e-mail address. You will need to follow the instructions in that message in order to gain full access to the site." And so many months later(today) I went back to see what it said, because truthfully I don't know my yahoo email account so I can't log in to get the set of instructions. That probably doesn't help I know and that probably IS the problem. But I was expecting the message from Star Project to go to my gmail account. But then again I didn't have that account BEFORE I signed up for this game site. So what do you suppose I do? Should I delete my account and make a new one[account] that makes sure the message full of instructions goes to my gmail account? Or do you think I should make a new account using the same email address or another email address? Any clue? I am sorry if this is troubling or makes me seem dumb. P.S. In case I didn't make it clear enough, when I went back on today and once again hit the re-(in? )validate my password, it sent the same message I got back a while ago when I first created the account. Well, I think I understand what you're saying. And if I'm wrong I apologize. You registered a game account but never activated it since you're unaware of your Yahoo account's information? It's not possible for you to have a validation email sent to your gmail account when you registered that account using a Yahoo email account. So, to ensure that you can receive your validation email, register with an email address that you can access. You need to actually open the email sent to you and follow the instructions contained inside to activate your account and play the game. If your old account has no significance to you, you should just make a new one and use your current email address as your registration email. I made an account, signed in, and press the play button but then it said "Access Denied". I tried playing it a couple of times but it won't let me play! PLEASE HELP ME, I really want to play!!!! I Made An Account 2 Weeks And 4 Days Ago But Whenever I Press The Play Button It Says "Access Denied" It's So Annoying PLEASE PLEASE PLEASE HELP ME I REALLY REALLY REALLY REALLY WANT TO PLAY IT, And I Know That You Have Already Told Someone Else That You Have To Verify Your Email But How Do You Do That? Ehhh....Go to your email? and click the link? the tada? Hey uhm... I looked through most some of Ren's events list, one said that one event needs 100 hearts and below... Ren has 186 hearts. Too late? how do i raise attraction? because i cant play the event , "conditions for living together"
You have to make sure that he is happy by going on dates with him. Okay, so bit of back story. I started playing Star Project about a year ago, I was obsessed with it, and made it pretty far in the game. After awhile, the log in screen began to tell me there was an error, that my log in was unrecognized. So, after getting fed up, and in a completely unrelated matter, having to dispose of a broken laptop, I stopped playing. I just started back up about 2 weeks ago. And again, I became hooked. I had the same problem happen again, so this time I changed my password, and things worked fine for a few days. However, its been 4 days since my last log in attempt, and again I get the same 'unrecognized log in or password'. I have Lazarus, so this shouldn't be happening. I don't want to go through the trouble of changing my password every time. Is there anyone who is experiencing something like this? Do you have any solutions? Hi. Do you know where can I find the synopsis of each scenario again? Cuz there was I quote I liked but forgot to list it down and forgot the scenario number too. You'll see it when you click on the event on the map portion. Thnx in advance. Hi!! ^_^ OKay so honestly, I started playing today. But, each time I play when I get to the part about looking at the questions so you know how to play (With that girl forgot her name)? At the end of it when I hit back for all of the options, it takes me back to the office and there is nothing to do. I click some of the icons but it says that I can't open during the opening... I don't know what's wrong!!! ;~; I really want to play too!! Can someone please help me?! Thank you!